← Evolutionary excursion into the depth of the human psyche? 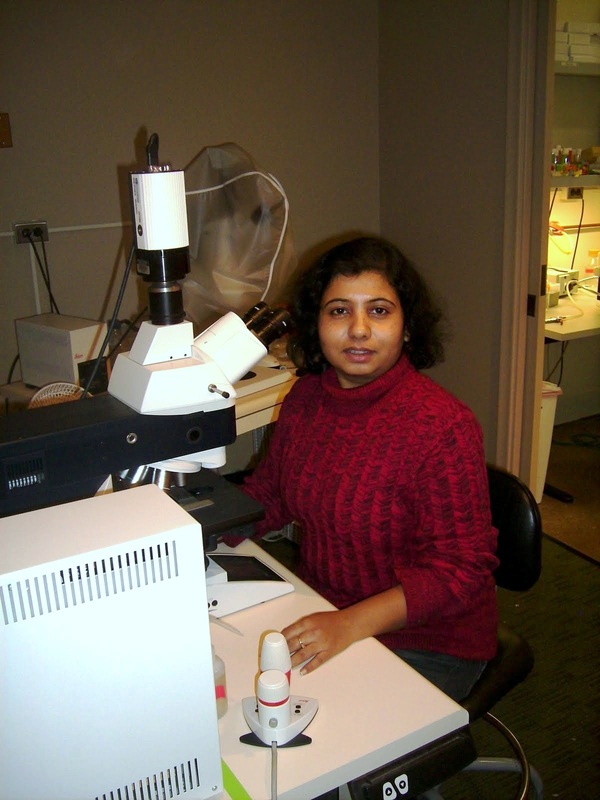 This week’s BEACON Researchers at Work blog post is by MSU postdoc Shampa M. Ghosh. It has been four decades since Thedosius Dobzhansky wrote “Nothing in biology makes sense except in the light of evolution.” It soon became a favorite quote for numerous biologists, while others argued against the apparent over-emphasis of evolution in understanding how biology works. Keeping the controversy aside, one cannot deny that in order to have a holistic understanding of biology, in order to explain why things are the way they are – be it at the level of molecules or the whole-organism, it is essential to have an understanding of evolutionary aspects that shape things. This is especially true for those of us who are enthralled by the natural world around us, the well-crafted biological complexity of the living world, and whose interests span from ‘how things work’ to ‘why things work this way.’ For us, understanding the evolutionary perspective of biological phenomena has no alternative. I am an integrative biologist and my broad interest lies in understanding the development and evolution of form and function. My research focuses on complex traits and the model organism for my research is the fruit fly Drosophila melanogaster. However, being a part of BEACON confers the advantage of exploring evolution beyond one’s own study system, and getting exposed to a fascinating array of evolutionary research-themes and scientists from diverse disciplines. This has helped me expand my view of evolution, and biology in general. The idea of studying ‘Evolution in Action’ has fascinated me ever since I worked on experimental evolution for my PhD at the Evolutionary & Organismal Biology Unit at JNCASR, India. I used laboratory selection approach to study the consequences of selection for rapid development on life-history traits and trait plasticity in Drosophila. 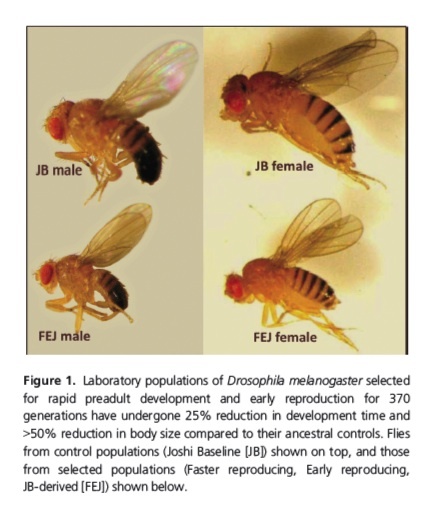 After selection for rapid pre-adult development for over 300 generations, these flies underwent a 25% reduction in their development time and 50% reduction in their body size, among other changes. My research also revealed the evolution of partial reproductive isolation between the faster developing populations and their slow-growing ancestors, caused by the divergent body sizes (Ghosh & Joshi 2012). Based on the findings of my doctoral research, I became fascinated by the evolution of body size and after finishing my PhD, joined the group of Prof. Alexander Shingleton (BEACON/MSU) as a postdoc. The Shingleton laboratory focuses on the developmental regulation and evolution of size and morphological scaling in Drosophila. For me, entering the Shingleton lab was the starting-point of integrating proximate mechanisms with ultimate causes. The broad theme of my current research is the developmental regulation of phenotypic plasticity and its evolutionary significance. Phenotypic plasticity is the ability of a genotype to produce different phenotypes in different environments, and is almost always adaptive in nature. Phenotypic plasticity can help organisms to cope with short-term environmental changes and survive in new or heterogeneous (over time and/or space) environments. 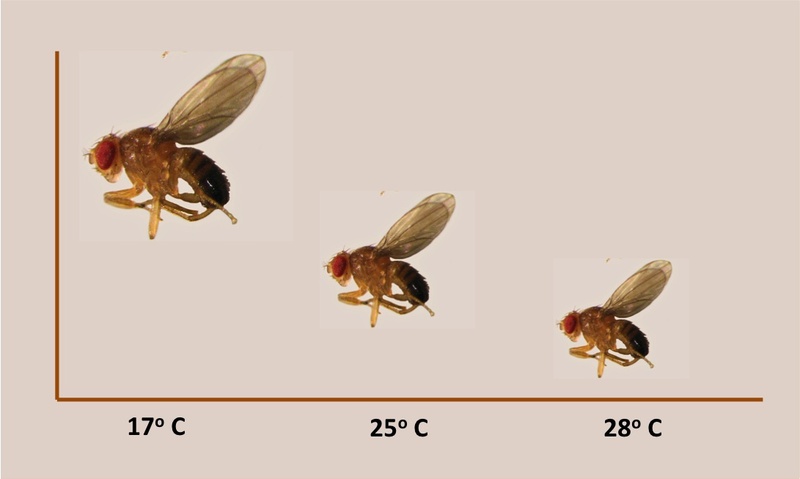 My work focuses on thermal plasticity – that is, the plastic changes in body and organ size of flies in response to developmental temperature – and its adaptive significance. My research spans multiple levels of biological organization. I am using physiology, genetics and genomics to find out how genes, pathways and physiological mechanisms give rise to thermal plasticity of size in flies. In order to understand evolution, biologists often take a top-down approach, exploring past and present patterns of selection to identify the traits and genes that are targets for selection. In the Shingleton lab, we often take an alternate, bottom-up approach, first identifying the genes and molecular mechanisms that control growth and development before exploring how these processes evolve to generate morphological diversity. My first approach was to study the physiological basis of thermal plasticity. About 85% of ectothermic animals, including Drosophila, show an inverse relationship between developmental temperature and body size called the ‘temperature-size rule’ (TSR), the proximate and ultimate causes of which are poorly understood. The TSR has been viewed by many as a biophysical constraint caused by the effect of temperature on the biochemical processes of growth, and not an adaptive phenomenon. According to other views, however, TSR is adaptive, evident from the observation that the evolutionary response of natural populations adapted in different thermal climates is the same as the plastic responses to rearing temperature: populations at lower latitudes (warm) evolve smaller body size compared to the ones from higher latitudes (cold) in most ectothermic species. If the TSR reflects a phenomenon that is purely biophysical in nature as opposed to an adaptive response, one would expect it to have a common mechanistic basis across taxa. I have recently demonstrated that the TSR in Drosophila results from developmental mechanisms that are completely different than the mechanisms that regulate the TSR in another insect, the tobacco hornworm Manduca sexta (Ghosh et al., in press). This suggests that the TSR can result from a diversity of mechanisms across taxa and hence represents an adaptation rather than a biophysical constraint. We are yet to identify what the TSR is an adaptation to, but we believe that identifying the focal traits that give rise to the TSR can potentially help us to understand the selective causes that lead to it. As a different approach to study plasticity, I am also using a genome-wide association analysis (GWAS) to understand the genetic basis of thermal plasticity in flies. For this purpose I am using The Drosophila Genetic Reference Panel (DGRP), a population of flies consisting of 192 inbred lines. Each DGRP line is isogenic and has been fully sequenced, and both the flies and the genomic data are publicly available. I have measured the degree of thermal plasticity in three different organs (wing, thorax and femur) in 100 DGRP lines and using GWAS to identify the genes that are associated with variation in thermal plasticity for the three organs. I am also screening the effect of mutations in candidate developmental genes on the degree of thermal plasticity. My current approaches promise to give me a good understanding of the proximate mechanism of thermal plasticity. In the future, I plan to extend my research to understand two different evolutionary aspects of plasticity: (a) the origin and evolution of plasticity, and (b) the role of plasticity in evolution. ital organisms, in laboratory based biological systems and in species in their natural habitat. This has helped me to get a better understanding of evolutionary processes observed across systems. I have also been a member of the BEACON Speciation Consortium headed by Prof. Jenny Boughman from MSU and Prof. Luke Harmon from UI, where I have interacted and brainstormed with many other BEACONites on topics related to multidimensional adaptation and speciation. Although there is little overlap between speciation and my current work on plasticity, my exposure to the evolution of reproductive isolation during my PhD had also sparked my interest in speciation. I have absolutely loved this opportunity and flexibility to indulge intellectually outside my main research area, and to be involved in what excites me. I do not think such opportunities would have been possible had I not been a member of BEACON. Overall, being a part of BEACON has helped me grow as an evolutionary biologist and expand my intellectual horizon. For more information about Shampa’s work, you can contact her at modak at msu dot edu. This entry was posted in BEACON Researchers at Work and tagged BEACON Researchers at Work, Biological Evolution, development, Drosophila, plasticity. Bookmark the permalink.